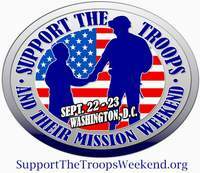 Friday, September 22, Morning - Visit offices of Congressmen and Senators in groups to express support for the troops and their mission in Iraq, Afghanistan and elsewhere fighting the war on terrorists. Time TBA. To sign up for this, click here. Please provide your name and that of your Congressman or Senator so we can schedule the meetings. Friday, September 22, Evening - Gather outside the main gate of Walter Reed Army Medical Center to thank our wounded warriors and their families for their sacrifices and to express support for the mission they have sacrificed so much for. Time: 6:30 p.m. to 9:30 p.m. Where: 7200 Georgia Avenue, NW, Washington, D.C. (intersection of Georgia Avenue and Elder Street, NW.) Street parking is available. Read the history of the Walter Reed rallies here. SATURDAY, SEPTEMBER 23. - THE MAIN EVENT! RAIN OR SHINE. Rally on the grounds of the Washington Monument at the Sylvan Theater. When: Noon to 3 p.m. Plan to arrive early (by 11:30 a.m.) as the rally will start promptly at noon. Real early arrivals can visit the World War II Memorial or other nearby attractions before the rally. My plans are to be at Walter Reed Friday night, and the Washington Monument Saturday. If you live anywhere the Washington DC area, or just can take some time off work and have never seen DC, please consider attending. I'm sure you've seen all of my posts about the rallies and counter-protests that I've attended. If not, you can view them all here. I'll tell you this; the troops do find out about what we do both outside of Walter Reed and elsewhere and every one I've spoken with says that it is much appreciated. I'm going to be upfront with you about the Saturday event; conservative rallies typically don't draw large crowds. Don't expect a sea of people. We're not anti-war libs with nothing else to do all day, and more to the point demonstrating is just not part of the conservative culture. Most conservatives just don't feel comfortable standing around or marching with signs and such. This is understandable as it is historically a leftie thing. Other than the annual Right to Life march, conservative rallies are typically small. But so be it. C-Span will probably be there and historically they've been good to us by keeping their cameras focused on the stage.